Adorama has the Canon EOS-5D Mark III DSLR Camera Kit with EF 24-70mm f/4L IS USM Lens available for preorder. Apparently, many people are finding the auto-updated NIK filters are crashing Photoshop CS6. The issue seems to be a related to a missing "MSVCP110.dll" file. On October 21, I was using the Sigma USB Dock to dial in focus adjstments on my 35mm f/1.4 DG HSM Art lens. I made several different focus adjustments and tested the lens after each one. After about four cycles of adjusting values and focus testing, I connected the lens to the USB dock and Sigma's Optimization Pro software told me there was a firmware update for the lens. I thought to myself, "What a coincidence that Sigma would release a lens firmware update during the hour I'm adjusting this lens." Sigma had not just released a firmware update. Even though my lens had been updated with the newest firmware a month earlier, Sigma Optimization Pro was insisting that my lens wasn't up to date. Every time I would connect the lens to the USB Dock, the software would insist on upgrading the lens's firmware. If I chose not to update the firmware, Optimization Pro would make the focus adjustments button inactive. And every time I chose to "update" the firmware, the autofocus adjustments were reset to "0." For some reason, the lens was reporting that it had the original stock firmware installed. After several failed attempts at getting the firmware update to stick, I called Sigma's technical support. Sigma's technical support adviced me to send the lens in for repair. On October 22 I packed up the lens (including the appropriate repair forms with contact and warranty information) and shipped it to Sigma's Repair Center in Ronkonkoma, New York. They received it on October 24. Sigma never sent me an email to confirm that they had received my lens (I got the delivery confirmation from FedEx). They never sent me an email to let me know they were processing my repair. There was no way for me to check the status of my repair online (that I could find). Sigma never sent me a return shipment notice. On October 30, I had an entry in my calendar to give Sigma a call and ask for a status on my lens repair. Before I gave them a call, however, a FedEx truck arrived with an unexpected package – my lens. The paperwork with the lens suggested that a circuit board had been replaced and the firmware had been updated by the Service Center. On the one hand, Sigma's turnaround time was fast - very fast, in fact. Considering that they received my lens on the 24th and had it back in my hands on the 30th suggests that Sigma has invested a significant amount of resources in making service and repair orders a priority. A recent "rush" repair order to Canon Professional Services took longer. But Canon's Repair Service trumps Sigma's in a big area - communication. When I send an item into Canon Service, I get an email showing that they received the item. They send me an email when they begin processing my repair. Then they send a shipment notice with tracking information when my item leaves their service facility. And at any time, I can also check the status of my repair on their website. But with Sigma – crickets. Update: Site visitor Don let me know he had a similar experience - a fairly quick turnaround with no formal communication. However, when he called Sigma to inquire about the repair, Sigma gave him very detailed information on what they had done. So if you're curious, you may want to go ahead and give Sigma Service a call. For Discussion - How did you get into photography? Somewhere down the road, we all stumbled across photography and became bitten by the bug. But how did it happen for you? How did you get into photography? What was the catalyst for picking up a camera? Permalink: For Discussion - How did you get into photography? Tamron has posted their Third Quarter 2013 Financial Results. We plan to test the Macintosh versions of the following software applications for compatibility with OS X version 10.9 (some older applications will not be tested). We will announce our plans regarding full compatibility once testing is complete. We do not intend to provide compatibility with the following applications. We do not plan to provide compatibility for other software, or for products utilizing a SCSI or serial connection. We apologize for any inconvenience this may cause. For further information regarding this matter, please contact Nikon Customer Support. 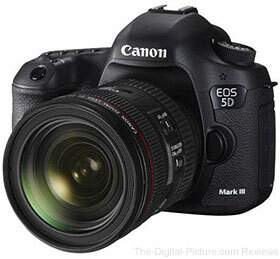 Canon will start selling 5D Mark III with EF 24-70mm f/4L IS USM Lens kits next month with an MSRP of $4,299.00. "Adobe Systems Inc said on Tuesday that the scope of a cyber-security breach disclosed nearly a month ago was far bigger than initially reported, with attackers obtaining data on more than 38 million customer accounts.The software maker also said that hackers had stolen part of the source code to Photoshop editing software that is widely used by professional photographers. The company disclosed the breach on Oct. 3, saying attackers took credit card information and other data from nearly 3 million customers' accounts. Adobe also said that the hackers accessed an undisclosed number of Adobe IDs and encrypted passwords that were stored in a separate database. On Tuesday, it revealed that about 38 million records from that database were stolen." Check out the rest of the article on Reuters. In architectural or urban photography, depending on the position of the photographer with respect to the scene, buildings? vertical and horizontal lines can lose their parallelism. With DxO Perspective, making buildings plumb again has never been easier: users simply place the anchor points directly on the image along the lines they want to correct, and unnatural façades instantly return to their original appearance. DxO Perspective corrects all kinds of perspective problems, even the most complex. Using its Rectangle tool, when a photo contains two perspective flaws, DxO Perspective?s Rectangle tool immediately reestablishes a full-frontal view of the object ? essential when shooting a photo of a poster or painting! In 8-point correction mode, DxO Perspective handles even more complex perspectives: the independent placing of horizontal and vertical guidelines provides highly precise corrections on multiple planes. Regardless of the corrections applied, DxO Perspective keeps photos full-frame, thanks to its automatic cropping feature that optimizes the visible field. Users can also customize the framing to highlight a particular element. A composition grid facilitates precise adjustments. Serious photographers can also adjust the intensity of the correction and the horizontal/vertical ratio according to their own tastes. DxO Perspective for Mac OS X is immediately and exclusively available in the Mac App Store. To access the application, click here. The software is free through November 3, 2013, instead of priced at $19.99?. The teaser videos from Nikon are getting progressively less subtle. In the fourth installment, the video ends with a pretty revealing shot and states, "Savor photography all over again 5 November, 2013." Firmware Version 1.2.3 incorporates the following improvements and fixes. Fixes a phenomenon in which the flash may not fire depending on the timing of when the shutter button is pressed. Fixes a phenomenon in which the LCD monitor may show a line of false color along boundaries of high contrast. Fixes a phenomenon in which the histogram of a LiveView image is incorrectly displayed when an HDMI cable is connected. Enables the brightness of the camera’s LCD monitor to be adjusted even when an HDMI cable is connected. * The phenomenon listed in 2 was addressed with Firmware Version 1.2.1, and has been further improved with Firmware Version 1.2.3. Firmware Version 1.2.3 is for cameras with firmware up to Version 1.2.1. If the camera's firmware is already Version 1.2.3, it is not necessary to update the firmware. When updating the firmware of your camera, please first review the instructions thoroughly before you download the firmware. Adorama carries the Canon EOS 5D Mark III. Today we’re excited to welcome Analog Efex Pro to the Nik Collection by Google. Our latest plug-in lets you reproduce the look and feel of classic cameras and processing methods without having to buy all that vintage equipment. Analog Efex Pro is more than just vintage presets. Advanced tools let you precisely adjust bokeh, textures, lens distortion and lots more. You can even use on-image controls to choose the centerpoint of any effects you add. If you’ve already purchased the Nik Collection by Google you’ll get Analog Efex Pro automatically, for free. Your copy of the collection will automatically update and you’ll see the new plug-in alongside SIlver Efex Pro, Viveza, and the rest of the Nik tools you use. This is just the beginning for Analog Efex Pro. We hope you enjoy this first version, and be sure to stay tuned -- we’ll be adding more cameras, more controls, and more creativity in the months ahead. Site visitor Laurence had a very specific problem – when converting videos taken with his DSLR from .MOV to AVI file format, the EXIF data never got stored in the AVI's metadata. He wanted a (free) software solution that allowed him to embed the EXIF information for future reference. The answer – abcAVI Tag Editor by software developer Alexander Sorkin. abcAVI Tag Editor allows you to embed tag information in the header of AVI files using the "Comments" and "Additional Information" fields. Open Canon's Digital Photo Professional (software bundled with the camera) and navigate to the source MOV file. In DPP, right click the MOV file and select INFO from the pulldown menu or just hit CTRL-I. This pulls up a dialog box with the Shooting Information and Metadata. Click any line in the Shooting Information section to highlight it, then CTRL-A to Select All, then CTRL-C to copy everything to the clipboard. Open the target AVI file in abcAVI Tag Editor. You will see four tabs labelled 'Primary Tags', 'Movie Credits', 'Additional Tags' and 'Other Tags'. Select 'Primary Tags', and you will see a field called 'Comments'. Right click anywhere in the field and hit CTRL-V. You will see the Shooting Info from the MOV pasted in. The same procedure can be done under the 'Additional Tags' tab to paste the Shooting Info into the 'Additional Information' field if you wanted to. Up at the top of the abcAVI Tag Editor window is an icon of a floppy disk. Click this and it saves the metadata changes (i.e., it writes the Shooting Info into the Header area of the AVI file). Now close abcavi Tag Editor. To verify that the EXIF data was saved, you can open the AVI file with a Hex editor or Notepad++ and you will see the Shooting Info right up at the top following the second 'LIST' entry. NOTE: For photographers who are into Geotagging or Geocaching, abcavi Tag Editor lets you easily add Lat/Long or Geocaching data to the rest of the shooting info (get lat/long from Google Earth if you don't have a GPS tracklog for your video location) and embed that into the AVI along with the rest of the Canon EXIF data. Just type it in manually anywhere you like with the other EXIF data you copied in from the MOV." Thanks Laurence for sending that in! 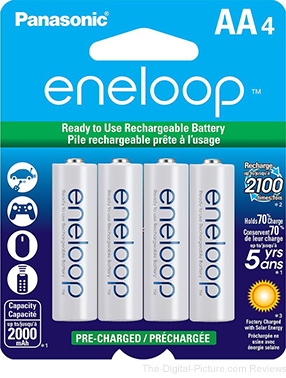 Amazon has eneloop 2000 mAh Pre-Charged AA Batteries (8-Pack) available for $16.98. Regularly $26.99. October 18, 2013 – SCOTTSDALE, AZ – Tether Tools is excited to announce two wireless tethering kits designed to meet the diverse needs of photographers integrating tablets in their tethered workflow. Each kit contains the gear necessary to wirelessly transfer images to an iPad/Tablet for instant image viewing and sharing. Tether Tools’ Starter Wireless Kit provides a great combination of product ideal for wireless image transfer and camera control from an iPad. Complete with a CamRanger Wireless transmitter, Wallee iPad/Tablet Case in black and a Connect Lite bracket for iPad mounting, this kit is designed for wireless tethered photo shoots in any location. The Connect Lite Bracket has dual 1/4”-20 receiving threads enabling photographers to mount the tablet on a tripod, arm/clamp, camera strap or stand for safe and easy access during a shoot. Adorama carries Tether Tools products.